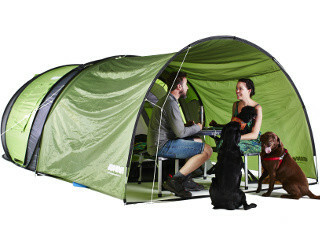 In 2014, we crowdfunded the ultimate pop-up tent, and the response was amazing. Now we’re back with our next generation Cinch! – and thanks to your feedback, we’ve redefined “ultimate”. The new Cinch! has a heat-reflective cover, enhanced solar power, and an extended canopy that provides 75% more space – plus the size, quality and durability of a high-spec dome tent with more cool features. It goes up in seconds and packs down inside a minute. Cinch! will revolutionise your camping adventures.